After years of dragging its feet, the city initially offered the property’s owner, New York City real-estate developer Norman Brodsky, $100 million for the 11-acre parcel, which he purchased years prior for $10 million. The piece of land, once home to CitiStorage until a massive fire burned the warehouse into the ground in 2015, cuts through the middle of the proposed park extension. Brodsky rejected the city’s initial offer and put out a call for bids online in the form of a public auction, enacting his own July 20 deadline for offers, one that came two weeks earlier than the city’s own August 8 cutoff. 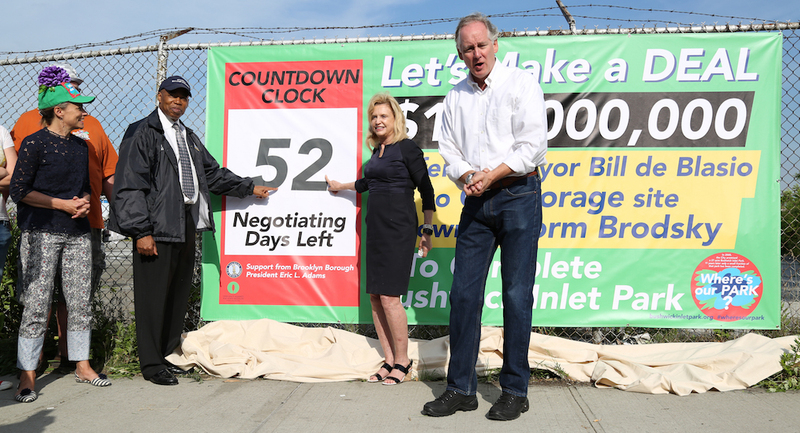 In an effort to pressure Brodsky to accept to offer, park advocates installed a countdown banner and collected signatures on a petition as the date neared. And during the final stretch, Friends of Bushwick Inlet Park and their powerful supporters including Brooklyn Borough President Eric Adams upped the ante by organizing a sleep-in near the site. The deal officially expired today, and since the offer was set in place, there’s been little news from the Brodsky camp anyway. The developer has declined to come back to the negotiating table since meeting very early on in the process, nor has he announced any winning bids or even possible takers. Property records show no signs any deed transfers for the lots in question. Nor has Brodsky recently commented on the matter in the press, despite multiple requests for interview from various publications, including Bedford + Bowery. But Brodsky’s inaction hasn’t put a damper on park advocates’ cause. At a rally outside City Hall this morning, about 100 people from the advocate group Friends of Bushwick Inlet Park and several community organizations like El Puente came out to show their support for the park, which residents say is needed to alleviate the congestion and overcrowding and bring much-needed green space to the area. 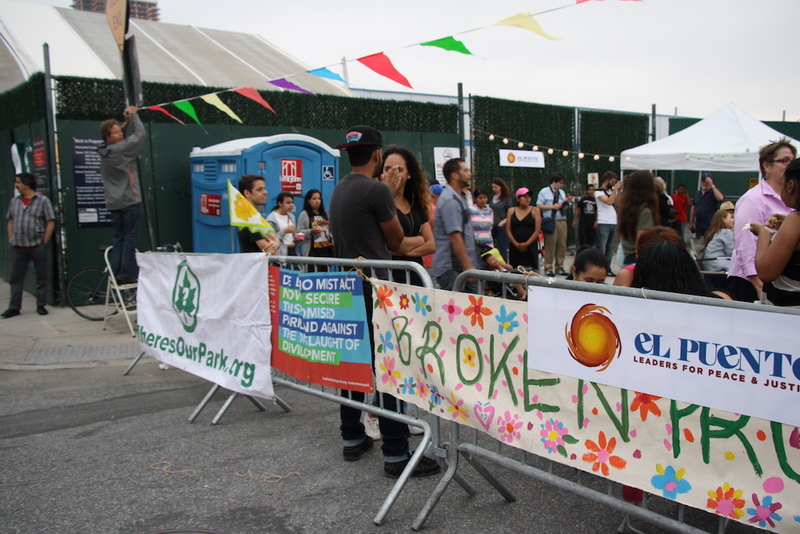 El Puente and Bushwick Inlet Park are among the groups that have long rallied behind Bushwick Inlet Park, but at least one new front has emerged in the struggle– supporters of a proposal known as Maker Park, (the group has ties to the advertising industry and Donald Trump’s son-in-law, the real-estate developer, Jared Kushner) have emerged in hopes of transforming Bushwick Inlet into an “adaptive reuse park.” Some ideas that have been pitched for Maker Park amenities include a walkable greenway, “viewing decks” installed atop old oil tanks, and an art gallery. Needless to say, the old timers haven’t been so keen on the new proposal. And yet, we’re a long way from discussing park specifics. However, city sources have said that eminent domain will not likely be used in this situation as it could significantly increase the cost to purchase the land, beyond what is financially responsible. It makes sense that the city would be a little gun-shy about the prospect of using eminent domain. As the New York Times reported, when the city resorted to eminent domain law to make a $12 million offer on a piece of land owned by a truck rental company, a judge countered by raising the price to more than $90 million, which the city ended up paying. The city’s already spent $198 million on purchasing the first 17 acres of parkland and an additional $25.8 million on that land’s development– all told, the city’s shelled out around $225 million for the yet-to-be-completed park, a dollar amount that’s already significantly higher than the initial estimates for the park’s total cost which included Brodsky’s land, valued between $60 and $90 million.